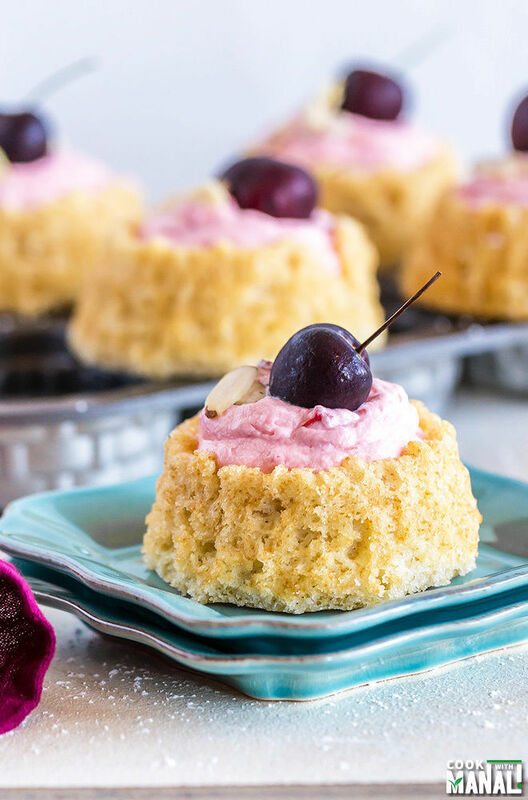 Mini Cherry Almond Cakes are the perfect little treats for your summer parties! It’s so nice to go to farmer’s market these days. It’s full of such pretty looking fruits and veggies that I end up buying much more than than 2 of us can possibly consume. However not my fault when all the fruits look so pretty! Seriously I wait for this season all year, I am a fruit and veggie junkie so summers is like heaven to me as far as food is concerned. This weekend I got lot of plums and peaches and cherries from the market. Have you guys seen/tried Italian plums? I saw them for the very first time at the market this weekend and obviously bought some. They turned out pretty sweet! Also, I never miss the chance to buy cherries while they are in season, after all they are so delicious and cherry season is short lived so why not make the most of it. Right? I have been wanting to make something with the cherry and almond combination forever. I really like the flavors together. Few weeks back I attempted something and it was a super flop show. I shared in on my instagram, so you guys can have a look if you like. That week was the worst, for 3 days constantly, whatever I made turned into a disaster. Really I felt like crying by the end of it. I even declared to my husband that I can neither cook nor bake. He just laughed, I think he’s so bored with my blog related rants that now he just laughs. :/ But anyhow those days are behind me now and finally things are back on track! Phew! So when folks at Nordic Ware sent me this pretty shortcake baskets pan, I knew I was going to make mini cherry almond cakes. I love how this pan is designed to hold fresh berries, sauces and whipped cream for a pretty presentation. I am a huge Noridc Ware fan, there pans are sturdy and so well built. I own their regular and mini Bundt Pans and absolutely love them. This year Nordic Ware is celebrating their 70th anniversary! Not only does Nordic Ware makes these super quality bakeware but their product line also includes cookware, grillware, kitchen gadgets and accessories. Visit their website to learn more. 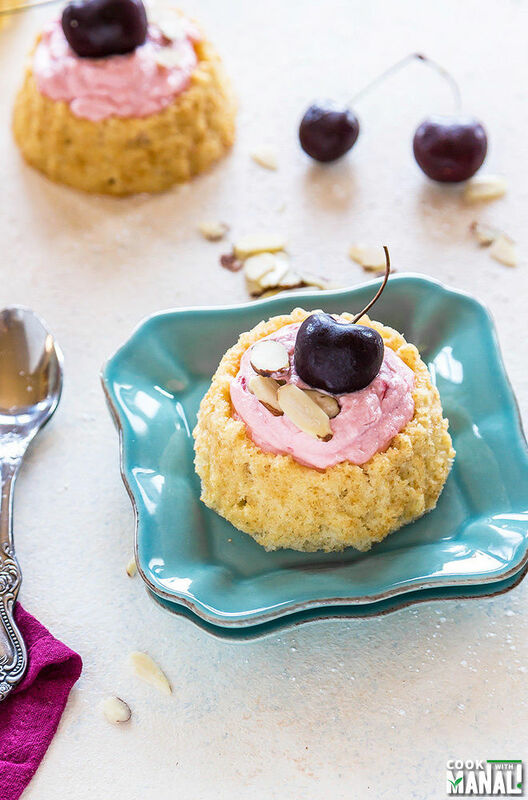 These mini cherry almond cakes are the perfect little treats to enjoy this summer. 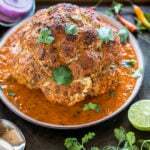 The recipe comes together quickly and the individual portions makes it easier to serve them at any get together or parties. Beat together sugar and butter till smooth and creamy using your stand or hand mixer. Then add egg, vanilla extract and almond extract and mix till well combined. Add in the flour mix, add it in 3 parts, alternating with milk. Beat till milk and flour are well combined but remember to not over-beat. Transfer batter to the pan. Remember to not fill the pan all the way till top. It should only be 2/3- 3/4 full. Bake at 350 F degrees for 18 minutes. Remove from oven and transfer on to a wire rack to cool completely. To make the frosting, place the bowl and the whisk attachment in the refrigerator for 15-20 minutes. 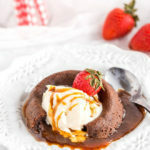 Beat the heavy cream using the wire whisk attachment of your stand mixer or using your hand mixer till it forms peaks. Set aside. Beat cream cheese with sugar till smooth and creamy. Add almond extract and cherry pie filling and beat till well combined. Fold in the whipped cream into the cream cheese till well combined. 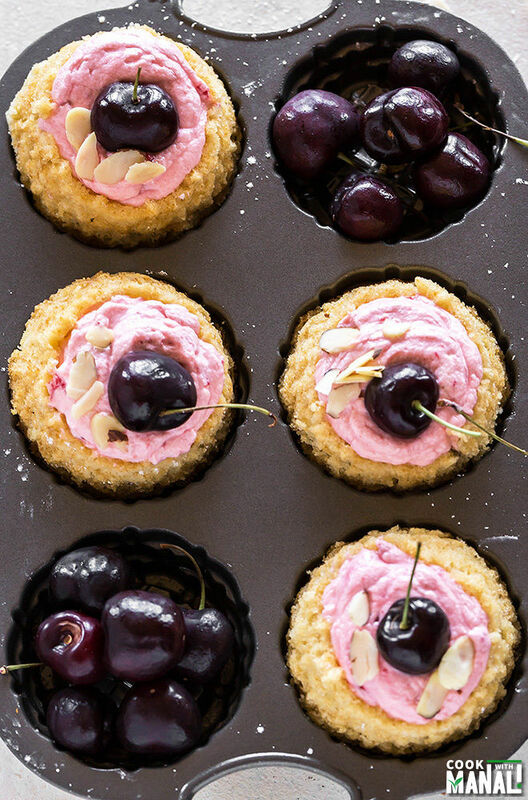 Spoon the whipped cream cheese on top of the mini cherry almond cakes. Garnish with fresh cherries, sliced almonds and serve. Disclaimer: I received free product from Nordic Ware. All opinions expressed are my own. 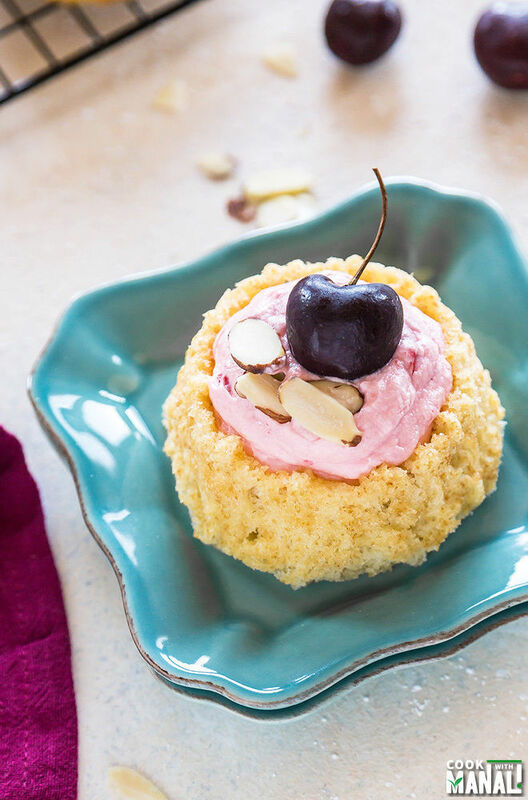 Mini Cherry Almond Cakes are the perfect little treat to enjoy this summer! Preheat oven to 350 F degrees. Spray shortcake pan with non-stick spray. Set aside. Add in the flour mix, alternating with milk. Add the flour in 3 parts and milk in 2 parts, starting and ending with flour. Mix till everything is well combined. Do not over-mix. Transfer batter to the pan. Remember to not fill the pan all the way till top. It should only be 2/3- 3/4 full. Bake at 350 F degrees for 18 minutes. Remove from oven and transfer on to a wire rack to cool completely. 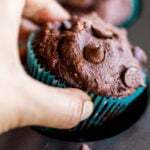 To make the frosting, place the bowl and the whisk attachment in the refrigerator for 15-20 minutes. Beat the heavy cream using the wire whisk attachment of your stand mixer or using your hand mixer till it forms peaks. Set aside. These cakes look so spongy soft Manali and cherry and almond flavor is so so good together!! I feel ya girl – there are days when nothing turns out good for me and I feel so disheartened and even quitting my food blogging job! 😛 Glad you are back on track!! Thanks Ami! and urgh, I hate those days! These are beautiful! Cherry and almonds go so well together, and they remind me of a dessert that I used to have when I was a kid. These cakes are gorgeous, Manali! I’ve been buying fresh cherries like there’s no tomorrow, so this sounds like the perfect recipe to put them to use. Love it! Oh my gosh, what gorgeous little cakes, Manali! I love the pink frosting and I just want to dig a fork into my screen right now! So I’ve never seen Italian plums…I’m intrigued! I’ll have to keep an eye out for them just in case they happen to show up in our area. But in the meantime, I’m gonna be busy eating all of these cherry almond cakes. 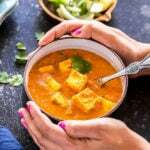 They look delicious, Manali! Love the shape! Yeah they look little different but taste good, I saw them for the first time too! Thanks David! I love the mini cakes! Perfect for portion control….unless I eat more than one! 🙂 There’s nothing better than using all the fresh fruit available right now. Thanks Kathy, I agree fresh fruits are so good right now! Farmers’ Markets are my favorite place to be these days! I just love these baby cakes, Manali! So pretty and delicious! Same here! Can’t get enough! Thanks Annie! I love cherry and almond together, they are so delicious! 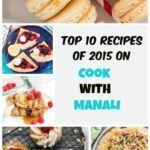 These cakes look so beautiful Manali, and I love the fresh cherries on top! 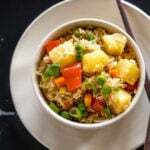 Looks really yummy… love to have one..? They look so delicious! The cherry-almond combo is always a winner. 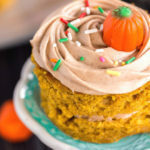 I know how it feels to have a cooking/baking week fail… but I think it’s part of the whole foodblog process… enjoy it! Thanks Azu! Yeah I know we all bloggers go through this cycle, it’s frustrating but like you said part of the process! I am so happy that cherries are here! I’ve been buying a bag every week and I don’t even feel guilty that they are kind of pricey. 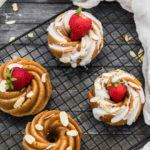 These almond cakes look DELISH! Love cherries + almonds together! Thanks Denise! I am buying them every week too, they are so good! I’m like a kid in the candy store right now with all the produce and I just can’t decide between all of it…so I get ALL of it! These cakes are SO gorgeous, Manali, and cherries and almonds are one of the best combinations ever! haha me too! You described it perfectly, exactly like a child in candy store! Thanks Marcie! I’m the same way, my mouth waters over all the summer produce 🙂 Love these adorable cherry almond cakes, Manali! So pretty too! Mini is always cuter! 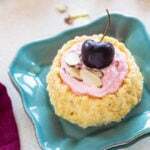 These almond cakes with cherries look scrumptious and beautiful. I also love Nordic Ware baking pans!!! this one is so pretty and love the mini cherry almond cakes!!! These are just so cute!!! I think they would definitely be a hit at a picnic or potluck. Love the flavor combo! These look beautiful and I love the pan! Great flavors, need to try them! I could eat 2-3 of these for dessert tonight! These mini cake look so fantastic and so beautiful with the bold cherries and almonds. Summer perfection! Oh my goodness. Cherry and almond is the best combo, and these look so pink and happy! My girls would love them. And we all have baking fails now and then. No worries at all!